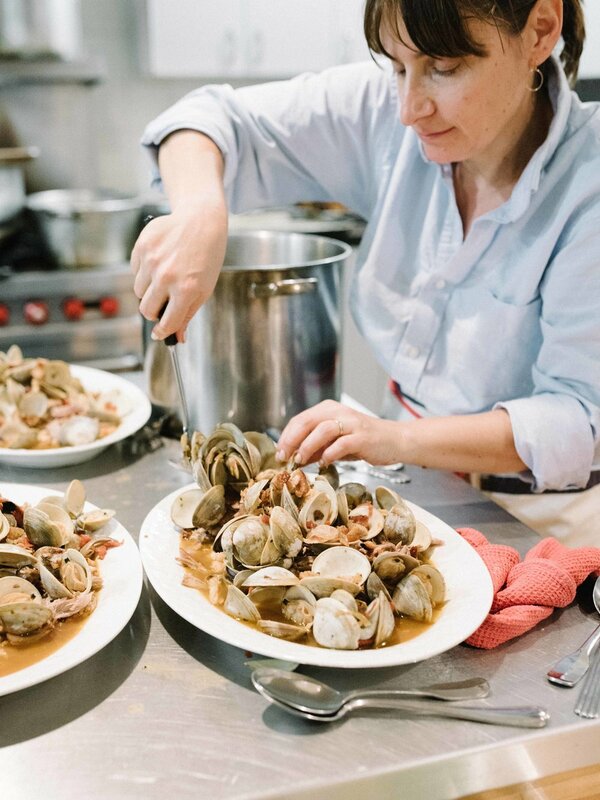 Michelle Mulford is the head chef and owner of Uncommon Feasts, a full-service boutique catering company specializing in creative private gatherings from personal celebrations at home to intimate weddings and small corporate events. 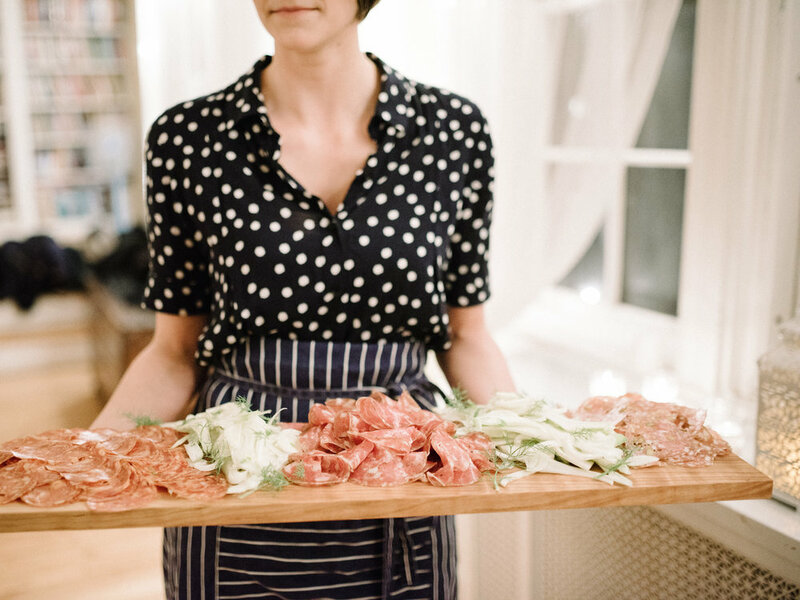 Michelle and her team host seasonal pop-up community dinners as a way to welcome new friends to the table to enjoy her food and gather for an evening of delicious food and cocktails - these events are public and welcome to all! What is the story behind Uncommon Feasts? How did this all come to be and start? I launched Uncommon Feasts from a small commercial kitchen just outside of Boston in 2014. But our roots reach down to meals shared growing up with my Sicilian family - handmade feasts showcasing vegetables from our backyard gardens - and up through a foundation of 14 years of work in nearly every realm of the restaurant industry, from restaurant kitchens, to serving as a personal chef to actors and directors, to a stint behind the cheese counter at Formaggio Kitchen. Whatever the venue - a home gathering, an intimate wedding, a small corporate event - we specialize in crafting an experience that captures the warmth, comfort, and ease that we each remember from our fondest meals shared with family and friends. We work with the finest New England ingredients, sourced from farmers we are deeply proud to support. Marianne Staniunas, our in-house beverage director, seeks out beverage pairings from small importers who work exclusively with natural wines, and from local craft brewers. We invite our clients to be as involved as they would like when designing their event, but we provide a full-service experience; from setting a beautiful table to serving every course with beverages that pair perfectly with the flavors guests are enjoying in the moment. At the end of the event, our fine-dining staff manages every aspect of cleanup with minimal waste to ensure our clients can enjoy their company. Can you give us a little information on your background in cooking and life? I always had the instinct to cook (and to eat), even as a child. I learned the value of using locally-sourced ingredients by watching my uncle in his garden, growing fresh vegetables and savory herbs that my grandmother and aunts would use in the warming, comforting meals we would enjoy as a family. I’m Sicilian, so the flavors I’m naturally drawn to are full of depth and richness, without being too fussy. I was taught to create everything from scratch, which is exactly how every dish is made at Uncommon Feasts. We source every ingredient locally, and make every dish by hand. A few client favorites are our house-cured salmon, grilled Moroccan lamb with preserved lemon relish and a sweet blood orange sorbetto. I have worked in every corner of the food business over my career, spending time at Formaggio Kitchen before starting Uncommon Feasts in 2014. How has the New England community played a roll in your business? We are immeasurably fortunate to benefit from New England’s abundance of organically-grown produce, and meat and fish from responsibly-raised and sourced animals. Over the years I have developed trusted relationships and lasting friendships with farmers and purveyors whom I rely on for my ingredients. Preparing any given meal may mean multiple trips to Boston-area farmers’ markets, road trips up to Maine, or meeting a farmer halfway, in a parking lot by the side of the highway. And certainly working through our New England seasons at times tests my creativity! But this is all so much a part of the fun and the joy of the food I create and share. We also rely on the rich community of local artisans - woodworkers, potters, spice importers - for all of the touches - the seasonings, the plating, the aromas that fill the room - that shape each unique culinary event. Did you grow up in New England? Yes! I’ve lived in Dover, MA and Lenox, MA and currently live with my family in Brookline. Who are your favorite NE vendors or businesses / people to partner with? Meat: Butchers: Buckle Farm (ME) *featured at our late winter pop up on March 3! Spices: Curio Spice (MA) *whom we created a custom Chai Tea blend with! Where are your favorite local spots to eat? I’m always interested to try new places that are opening in this vibrant food community and support the immense efforts of local talented chefs. Neptune Oyster, Coppa, Island Creek Oyster Bar, Forage are among my favorites, and looking forward to trying Tallula when they open in the old TW Food(another old favorite) location. What are you working on for the future of Uncommon Feasts? Any goals in mind or direction you want to take it in? As our specialty is with intimate personal celebrations, events with 20 - 70 guests, we are looking forward to a full summer ahead with some unique events; special rehearsal dinners, small weddings, Anniversary parties and corporate parties. We’re also excited for more pop-up style events in the coming year, where we will continue to collaborate with new farmers, brewers, wine importers, and local artisans (contact us if you’re reading and are interested!) Finally, we will be hosting more intimate dinners focusing on pairing beverage with our food. Our business is growing and we’re thrilled to bring Uncommon Feasts to more celebrations! What do you love most about New England? The weather. Ha ha ha! New England is where Marianne and I are from. It’s a part of us that we’re proud of. We have a deep sense of pride for the quality of food grown and raised here and want to show people that eating locally is a joy. What is your favorite part about cooking for and hosting dinners / events? My favorite moments are when I peek into the dining room and see smiling faces over candle light. Everyone with elbows on the table, eating and drinking and enjoying a few moments of connection with the ones they care for most. Any upcoming events you want to share?